Now that the U.S. debt ceiling season is upon us again, I've been wondering if the U.S.'s official gold price is going to finally be revalued from $42.22. Why so? Since March the U.S. Treasury has been legally prohibited from issuing new debt. Because the government needs to continue spending in order to keep the country running, and with debt financing no longer an option (at least until the ceiling is raised), Treasury Secretary Mnuchin has had no choice but to resort to a number of creative "extraordinary measures," or accounting tricks, to keep the doors open. Here is a list. They are the same tricks that Obama used in his brushes with the debt ceiling in 2011 and 2013. The general gist of these measures goes something like this: a number of government trusts and savings plans invest in short term government securities, and these count against the debt limit. As these securities mature they are typically reinvested (i.e rolled over). The trick is to neither roll these securities over nor redeem them with cash. Instead, the assets are held in a limbo of sorts in which they don't collect interest—and no longer count against the debt limit. This frees up a limited amount of headroom under the ceiling that the Treasury can fill with fresh debt in order to keep the government functioning. These tricks provide around $250-300 billion of ammunition. Which sounds like a lot, but in the context of overall government spending of $3.7 trillion or so per year, it isn't. Most estimates have the extraordinary measures only lasting till September or October at which point a default event may occur, unless Congress raises the ceiling. Not on the official list of measures for finessing the debt ceiling is a rarely-mentioned option that I like to call the gold trick. The U.S. government owns a lot of gold. Beware here, because a few commentators think that the idea behind the gold trick is to sell off some of this gold in order to fund the government. Nope—not an ounce of gold needs to be sold. The only thing that the Treasury need do is raise the U.S.'s official price for gold. By doing so, it automatically gets "free" funding from the Federal Reserve, funding which doesn't count against the debt ceiling. We need a bit of history to understand the gold trick. 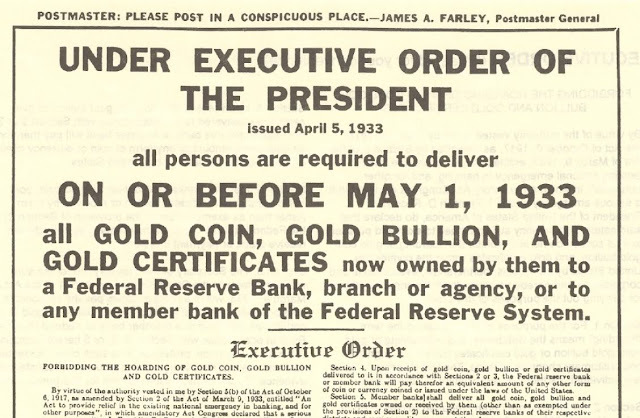 Back in 1933 all U.S. citizens were required to sell their gold, gold certificates, and gold coins to the Fed at a rate of $20.67 per ounce. This is the famous gold confiscation that gold bugs like to talk about (see picture at top). The 195 million ounces that the Fed accumulated was subsequently sold to the Treasury. In return, the Treasury provided the Fed with gold certificates obliging the Treasury to pay them back. At the official price of $20.67, these certificates were held on the Fed's books at $4 billion. The certificates the Fed received were a bit strange. A gold certificate usually provides its owner with a claim on a fixed quantity of gold, say one ounce, or 1/2 an ounce. In this case, the certificates provided a claim on a nominal, not fixed, amount of gold. If the Fed wanted to redeem all its certificates, it couldn't ask the Treasury for the 195 million ounces back. Rather, the certificates only entitled the Fed to redeem $4 billion worth of gold at the official price. As long as the yellow metal's price stayed at $20.67, this wasn't a big deal. But it had important consequences when the official gold price was changed, which was exactly what happened in January 1934 when President Roosevelt increased the metal's price from $20.67 to $35. At this new price, the stash of gold held at the Treasury was now worth $6.8 billion, up from $4 billion. But thanks to their odd structure, the value of the Fed's gold certificates did not adjust in line with the revaluation—after all, they offered little more than a constant claim on $4 billion worth of gold. The remaining $2.8 billion worth of gold, which had been the Fed's just a month before, was now property of the Treasury. Almost immediately the Treasury printed $2.8 billion worth of fresh gold certificates, shipped these certificates to the Fed, and had the Fed issue it $2.8 billion in new money. Voila, the Treasury had suddenly increased its bank account, and it didn't even have to issue new bonds, raise taxes, or reduce program spending. All it did was change the official gold price. Even when the U.S. eventually went off the gold standard—unofficially in 1968 and officially in 1971—it still maintained the practice of setting an official gold price. But by then the official price was no longer the axis around which the entire monetary system turned; it was little more than an accounting unit. After the 1973 revaluation the government stopped trying to keep up to gold's parabolic rise, and to this day the U.S. maintains an archaic price of $42.22, far below the actual price of $1250 or so. Let's bring this back to the present. Come October, imagine that the U.S. Treasury has expended all of its conventional extraordinary measures and Congress—despite having a Republican majority—can't decide on increasing the debt ceiling. Desperate for the cash required to keep basic service open, Treasury Secretary Mnuchin turns to an archaic, long forgotten lever, the official gold price. Maybe he decides to change it from $42.22 to, say, $50, or $100, or $1000—whatever amount he needs in order to fund the government. The mechanics would work exactly like they did in 1934, 1972, and 1973. The capital gain arising from a rise in the accounting price would be credited to the Treasury in the form of new central bank deposits, and these could be immediately deployed to keep the government running. As for the Republican's base, many of them are keen on ending the Fed—anything that smells of a return to gold will make them happy. This seems to be a piece of legislation that pleases all factions. The gold trick only works because the debt issued by the Fed—reserves, or deposits—is not included in the category of debts used to define the debt ceiling. By outsourcing the task of financing government services to the Fed via gold price increases, the Treasury can sneak around the ceiling. This is only cosmetic, of course, because a debt incurred by the Fed is just as real as a debt incurred by the Treasury, and so it should probably be included in the debt ceiling. After all, the taxpayer is ultimately on the hook for debt issued by both bodies. An increase in the price of gold to its current market price of $1250 would only be a band-aid. While it would provide the Treasury with around $315 billion in new funds from the Fed, this would be enough to evade the debt ceiling for just a few months, maybe half a year. Sure, a few well-time Donald Trump tweets about the greatness of gold might push the price up by $50 to $1300, but even that would only buy the Treasury an extra $13 billion or so in central bank funds. The Fed would hate the gold trick. Much of Fed policy over the last few years has involved communicating with the public about the future size of the Fed balance sheet, which shot up over three rounds of quantitative easing. A sudden $315 billion increase in liabilities outstanding due to a revaluation of the official gold price to $1250 would throw a wrench in this strategy. To the public, it would look QE4-ish. QE is reversible. Unlike QE, the Fed would not be capable of reversing a balance sheet expansion caused by a gold revaluation, at least not without the Treasury's help. This would severely damage the Fed's independence. To see why, keep in mind that the Fed can only ever increase the money supply if it gets an asset—a bond, mortgage backed securities, gold, etc—in return. The advantage of having an actual asset in the vault is that it can be sold off in the future should a constriction in the money supply be necessary. Assets also generate income which can be used to pay the Fed's expenses like salaries or interest on reserves. With the gold trick, however, the Fed is being asked to increase the money supply without receiving a compensating asset. This means that, should it be necessary to drastically shrink the money supply in the future, it will only be able to do so by relying on goodwill of the Treasury. So much for being able to act independently of the President. That the Fed probably prefers that the Treasury avoid a gold revaluation is one reason that it has never become one of the go-to extraordinary measures for finessing the debt ceiling. But I'm not sure that the current administration is one that cares very deeply about what the Fed thinks. If Congress greenlights the revaluation, there's really nothing that Fed Chair Yellen can do except enter-key new money for Mnuchin. Earlier I mentioned that adjusting the official price to $1250 would only be a band-aid solution. Here's a bit of speculative fiction: imagine that come October the official price is adjusted up to something like $2000, or $5000, or $10,000. Granted, this would put it far above the market price of $1250--but the official price has been wrong for something like fifty years now; does anyone really care if the error is now to the upside rather than the downside? At an official price of $10,000, for instance, the Treasury would get some $2.6 trillion in spending power from the Fed, enough for it to avoid issuing new t-bills and bond in excess of the debt ceiling for several years. The Republicans would save face; they could tell their constituents that they held firm against an increase in the ceiling. When the Democrats--who are no friends of gold--inevitably come back to power, they could simply go back to the tradition of jacking up the debt ceiling. This would certainly be a strange world. During Republican administrations, bond and bill issuance would slow dramatically, reserves at the Fed expanding in their place. Like the various QEs, there is no reason that these reserve expansion would cause inflation. The Fed would have to be careful that it pays enough interest on reserves that banks prefer to hoard their reserves rather than sell them. This increase in the Fed's interest burden would dramatically crimp its profits, which are paid out as a dividend to the Treasury each year. In fact, all the money the Treasury saved on not paying t-bill and bond interest would be almost precisely cancelled out by a shrinking Fed dividend. There is not much of a free lunch to be had. Investor who like to hold government debt in their portfolios would be in a bit of a jam. Everyone can buy a t-bill, but the ability to hold reserves is limited to banks. Unless the Fed were to allow wider access to their balance sheet, Republican administrations resorting to the gold trick would create broad safe asset shortages. While a small increase in the official gold price may be part of Mnuchin's backup plan, a large increase to the official gold price is just speculative fiction. After all, a boost in the official price of gold to $10,000 would create an entirely different monetary system. Alternative systems are certainly worth exploring for what they teach us about are own system, but one would hope that the actual adoption of one would come after long debate and not as a result of opportunistic politics. P.S. After writing this post, I stumbled on a paper by Fed economist Kenneth Garbade which describes how Eisenhower finessed the debt ceiling by using a version of the gold trick. Unlike 1972 and '73 the gold price was not increased. Instead, the Treasury was able to make use of unused space from the 1934 revaluation. A large portion of the gold the Treasury owned had not yet been monetized by writing up gold certificates and depositing them at the Fed. In late 1953, with the debt ceiling biting, around $500 million in gold certificates were exchanged with the Fed for deposits. Nick Rowe points out that if a central bank wants to control the economy's price level, it needn't issue any actual money—it can just edit the dictionary every morning, announcing the meaning of the word "dollar" or "yen" or "pound" to the public. To a modern ear trained on a steady diet of central bank verbiage about interest rates, QE, and open market operations, the idea of conducting monetary policy by simply editing the meaning of a word seems odd. But I've got news for you: starting from Caesar's time and extending into the 1700s, the sort of dictionary money that Nick describes has been the dominant form of money in the West. How has this system worked? People have historically advertised prices for wares using a word, or unit of account, the LSD unit being the most prevalent. In the case of Britain this meant pound/shilling/pence while in France it was livre/sous/denier, both of which come from the Latin librae/solidi/denarii. The monarch was responsible for declaring what these words meant. More specifically, the king or queen would post a sign in some central area saying something to the effect that a pound, or £, was worth, say, ten testoons, a type of silver coin. This definition was subject to change. The next day, for instance, an edict might be issued saying that a £ was now only worth nine testoons. Or, put differently, the £ now contained less silver. Just like that, prices had to rise 10% to account for the alteration made to the dictionary meaning of the word "pound." Dictionary systems came to an end when the symbol for money was finally fused directly with the instrument itself. Remember, coins never used to have denominations, or units of account, on their face. Rather, they usually only had the monarch's head inscribed on them, maybe the name of the mint, and a few words about how awesome the monarch was. This lack of numbering was convenient. Since coins had no association with the unit of account, the quantity of coins (and thus silver) in the unit of account (i.e. the definition of the word) could be seamlessly changed by royal proclamation. In the 1700s monarchs began to adopt the practice of inscribing the actual unit of account directly on the coin's face, i.e. coins began to be etched with 5¢ or £0.5. * Once this happened it became awkward to change the definition of the unit of account by editing the dictionary. Having permanently stamped the meaning of the word "dollar" or "pound" on millions of widely-circulating bits of stamped silver, changing that meaning by simply posting a sign on a popular street corner no longer did the trick. Every coin would have to be recalled and re-minted too! Having long since put the definition of the word "dollar" or "yen" onto the actual instruments they issue, modern monetary authorities now have to do something to the instruments themselves if they want to conduct monetary policy. Maybe they issue a few more units of money or buy them back in order to alter their purchasing power. Maybe they jiggle the interest rate that those tokens throw off. Or they might raise or lower a currency's peg. Some sort of tangible action (or threat thereof) must be taken to change the economy-wide price level. Word updates won't do. About the only place in the world that has dictionary money is Chile which, buffeted by high inflation, adopted a parallel unit of account called the Unidad de Fomento (UF) in the 1960s. (For more on the UF, see my old post here). Today, Chileans can choose to set prices in UF or in the Chilean peso. The latter is a conventional money, the word "peso" being defined as the 1 peso banknote issued by the nation's central bank. Unlike the peso, the UF lacks an underlying UF banknote. Rather, the Chilean government defines the word "Unidad de Fomento" to mean the number of Chilean pesos required to buy a fixed Chilean consumption basket. This definition changes every day and is posted here. I think this is a pretty neat idea. As long as Chileans denominate their salary and other contracts using UFs rather than pesos, they are guaranteed to earn a steady stream of consumption, even if the Chilean peso hyperinflates. These days inflation isn't really such a big deal, at least not in developed nations—central bankers seem to have mastered how to keep the purchasing power of the medium of exchange from getting out of hand. So adopting something like the UF might seem redundant. A dictionary money system is also unattractive because it imposes a calculational burden on citizens. People must be constantly doing conversions between an item's sticker price and whatever happens to be the medium of exchange necessary to complete the transaction. So if a book were to be priced at $5, you'd have to consult a government website to determine how many bitcoins, or dollar bills, or silver coins would be necessary to constitute a five dollar payment. The advantage of our current system is that because the word and the medium are unified, we don't have to do these conversions. A five dollar bill always suffices to cover a $5 sticker price. Simple. On the other hand, dictionary money may have a role to play in our relatively recent deflationary age. Beginning with Japan back in the late 1990s, central bankers all over the world have been incapable of preventing deflation, or falling prices. Are their tools inadequate? Do they refuse to use these tools to their full extent? Do they not understand how to use them? With dictionary money, a central banker can't blame his or her tools for a miss, since all it takes to alter the price level is an update to the definition. A child could do it. For instance, a nation like Japan could create dictionary money by removing the word "yen" on bills. It would do so by recalling all outstanding banknotes and replacing them with, say, Japanese pesos. Prices, however, would continue to be set in terms of the yen unit of account. Each morning the Bank of Japan would announce to the world how many Japanese pesos were in a yen. Say it starts with the yen being defined as ten pesos. To create some inflation, it would simply proclaim that the yen now contained just five pesos. Everyone with pesos in their pocket would suddenly be able to buy twice as much yen-denominated products as before. They would race out and spend. Shopkeepers who had previously been selling widgets for 1 yen, and getting ten Japanese pesos as payment, would quickly jack up prices to 2 yen in order to ensure that they still earn ten pesos per widget. Most of the world's money is currently in the form of deposits created by banks. After the 2008 credit crisis, which instilled a strong suspicion of banks among the public, it became fashionable to ask what money would look like in an economy without these organizations. Burn them to the ground or shutter them, what would take their place? One vision is to pursue pure centralization: have the state monopolize all money creation, say by providing universally-available accounts at the nation's central bank. Positive Money is an example of this. Another alternative, by way of Satoshi Nakamoto, is to pursue radical decentralization: replace bank IOUs with digital commodity money in the form of bitcoin and other private cryptocoins. I'm going to provide a few historical examples that sketch out a third option for replacing banks; bills of exchange. A system underpinned by bills of exchange is capable of converting illiquid personal IOUs into money using a distributed method of credit verification, as opposed to a centralized method patched through a banking organization. Unlike bitcoin, however, these are IOUs, not mere bits of digital ledger-space. While few people these days are familiar with the bill of exchange, in its hey day this instrument was responsible for executing a large chunk of the Western world's transactions. The first story is of cheques, an instrument that while not precisely a bill of exchange gets pretty close. Last week in my homage to the cheque I brought up the Irish bank strike of 1970, described by Antoin Murphy (from whom I steal the title of this blog post). When the nation's banks shuttered their windows for half the year, Irish citizens re-purposed uncleared cheques as personal IOUs, these cheques circulating as a cash substitute. The system was decentralized in that banking institutions no longer served as creators of the medium for making payments; instead, everyone became their own unique money issuer. As Tim Harford recently wrote, pubs and corner shops were able to vouch for the creditworthiness (or not) of each cheque. Irish cheque money only circulated for six months. After the banks reopened in November 1970, mounds of cheques were cleared & settled and the system returned to normal. Luckily, we have historical examples that lasted much longer than this. Let's go back in time to Antwerp in the late 1400s. The institution of banking had been present in Europe for a few centuries, but according to Meir Kohn (who I get much of this material from) it began to go into decline at the end of the 15th century as waves of bank failures broke out across the continent, due in part to coin shortages. In Antwerp, the authorities went so far as to ban the practice of banking in 1489. In lieu of bank deposits, coins could of course be used to make payments, but this would have been a step backward since deposit banking had emerged, in part, to solve the problems related to coins, specifically the fact that they are expensive to store, awkward to transport, and heterogeneous, some coins containing more precious metals than others. Similar to the Irish five hundred years later, Antwerp's financiers adapted to the death of bank money by innovating a decentralized alternative. Where the Irish chose cheques as their payments instrument, Antwerp settled on a related paper-based order called the bill of exchange. A bill of exchange was a popular way to remit money in medieval times. Say you were a citizen of Florence and you needed to get 20 gold coins to a relative in Venice. Rather than incur the cost and danger of transporting the coins yourself, you might try and strike a deal with a merchant who had offices—and gold—in both cities. By paying the merchant some gold in Florence, your home city, he would issue you a bill of exchange. This bill ordered his colleague in Venice to pay out 20 gold coins to whoever happened to be the bill bearer. You'd then send the bill to your relative in Venice, and he'd bring it into the office and collect the money. The merchant would earn a commission on the deal. No actual gold would travel between the two cities, just a secure and light paper instrument. It was a fantastic technology for saving on the costs of shipping and handling heavy coins. While bills of exchange started out as remittance instruments, they were later used by merchants as a form of credit. A merchant might want to sell some wool to a manufacturer who in turn required three months to convert the wool into cloth and sell it. To finance the purchase of wool, the manufacturer could always turn to a banker. Absent a banker, the merchant himself might provide the manufacturer with a loan by drawing up a bill of exchange. On its face this bill contained written instructions ordering the manufacturer to pay x coins three months hence to the bearer of the bill. The merchant would keep it in his desk, and when the requisite amount of time had passed he would bring the bill to the manufacturer and collect on his debt, earning interest in the meantime. The common denominator of a bill of exchange, whether used as a remittance or as credit, is that a private citizen has issued their own personal IOU, to be redeemed for cash after some time has passed. Then Antwerp happened. To further protect anyone who received a bill of exchange in payment, Kohn tells us that these instruments were granted currency status by Antwerp's merchants. As I wrote here, this meant that even if the bill of exchange had been stolen from merchant B and paid to merchant C (who had innocently accepted it), merchant B could not sue merchant C to get the bill back. This legal upgrade would have further promoted the liquidity of bills of exchange, since merchants needn't bother setting up burdensome verification processes to ensure that bills of exchange presented to them were not stolen. In the eyes of merchant law, all bills of exchange were considered "clean." There was still one last barrier to creating a truly decentralized medium of exchange; how to overcome stranger danger. Say that you and I are acquaintances and I owe you $20. I tell you I'm going to settle my debt by giving you an IOU issued by another party. Banks are a great way to solve the stranger problem, since everyone will agree to settle debts using the IOUs of a well-known and trusted intermediary like a bank. But say instead I offer you a $20 bill of exchange that I've received from a friend. If you know that person you'll probably accept the deal, but in an economy like Antwerp's with thousands and thousands of actors, you might not know the name of the debtor written on the bill. And without enough knowledge to accept the credit, you'd have probably refused it. According to Kohn, the final innovation developed in Antwerp solved the stranger problem—the ability to endorse a bill of exchange. I simply signed my name to the back of $20 bill of exchange, or endorsed it, and handed it to you. By signing it, I was agreeing to accept the debt as my own. So if the original debtor failed to pay you for the bill when it came due, you could flip the bill over and pursue the first name on the list of endorsees—me—for payment. And since you knew and trusted me, it was now possible for you to evaluate the credibility of a $20 bill of exchange that had originally been issued by a stranger. Bills could in turn be re-endorsed on by others, a long chain of transactions being made before the bill finally expired. Indeed, Henry Dunning Macleod once remarked that bills might sometimes have "150 indorsements on them before they became due." Not only did this chain of cosigning individuals solve the stranger problem. It also created an incredibly safe instrument. Bills of exchange were effectively secured not only by the original person whose name was inscribed on the front, Vann, but by all the others who had cosigned the back; Alcock, Marriott, Whittles, etc. The odds of everyone on the list failing would have been quite low. It was an ingenious system. Another interesting anecdote on bills of exchange comes from the county of Lancashire in north west England in the 1800s. By then, banknotes had long since been invented and were a popular payments medium in England. Typically issued by small private "country banks," banknotes were a centralized payments technology insofar as their value depended on the good credit of one issuer, the bank. Inhabitants of Lancashire were particularly suspicious of these instruments which explains why there were almost no note-issuing banks in the county. T.S. Ashton speculates that this wariness was due to the 1788 failure of Blackburn-based Livesay, Hargreaves and Co, a banknote issuer: "generations after, when proposals were made for local notes, men's minds turned back to the events of 1788." In the absence of a system of banks providing transferable deposits or notes, bill of exchange circulated in Lancashire, even dominated, so much so that they were often "covered with endorsements" and become famous for their dirty appearance. Indeed as late as the 1820s, Ashton tells us that some "nine-tenths of the business of Manchester was done in bills, and only one-tenth in gold or Bank of England paper." Bills were used even in small denominations, say to pay piece workers. This is surprising because bills of exchange had typically been used by merchants and wholesalers, and therefore tended to be issued in large denominations. Alas, according to Ashton the Lancashire bill of exchange was done in by the increase in stamp duties, which effectively made it more cost-effective to use bank-issued forms of payment that didn't require a stamp. Just a few random thoughts in closing. While Ireland, Lancashire, and Antwerp all provide a sketch of an alternative, distributed form of converting personal IOUs into money, do we really need a replacement for banks? While the U.S. banking system certainly had its difficulties in 2008, Canadian banks skated smoothly through the crisis. 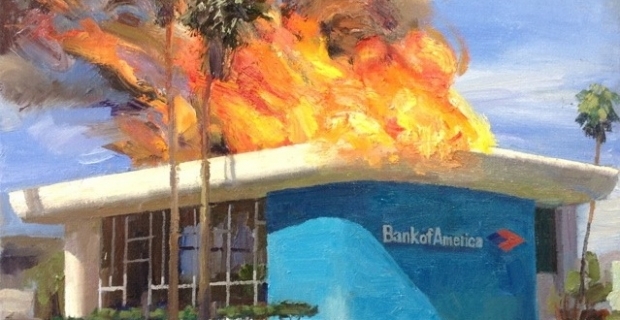 Maybe banks only need a face lift.